Being able to read and understand the information molded on a tire?s sidewall will make it easier for you to answer questions and make better assessment when buying tires for you car. Tire Sizing is also known as “Plus Sizing” on a tire. “Plus sizing” refers to changing to a shorter tire sidewall without changing the overall diameter of the tire, in order to maintain speedometer accuracy and not upset other systems such as traction control. The number after the plus indicates how many inches larger the wheel diameter is. For example, “Plus one” means that the new wheel is one inch larger than the original wheel. Advantages may include greater handling and cornering abilities of the car, but this is more a result of the wider tread face and stiffer sidewall of the plus size tires, and can be achieved with tires that are simply stiffer and wider instead of plus sized. Wider tires may decrease braking distances on dry pavement, but see the section on the disadvantages of plus sizing to learn about the physics of plus sizing and the factors that may realistically cancel the benefits of wider tires out. There is a subjective “appeal” of larger wheels, as in the eyes of some individuals larger wheels are more appealing. Besides from the obvious cost difference, plus sizing past Plus 1 will seldom give you much added performance. Additionally, the tread life of the tire is much more likely to wear out quicker and many vehicles will need a new set of wheels to match the new set of tires. Larger tires are also much easier to damage, more susceptible to hydroplaning (riding the surface of the water), and less effective in wet weather. Plus sizing also does not enhance the value of the vehicle (and in some cases diminishes it, since a new set of wheels means the vehicle is not on par with original factory recommended specifications along with not having original factory parts) and SUV/Truck owners will be more vulnerable to rollovers. Ride comfort will also have to be sacrificed in order to deal with performance enhancement. Furthermore, despite what has been said in other portions of this entry, plus sizing may significantly decrease the acceleration, braking, and fuel economy of a vehicle. Even though the overall wheel diameter measured at the tread may stay the same, the combination of a moving the heavy rim component of a wheel outwards from the center of rotation of the wheel results in a significant increase in rotational mass for each wheel, assuming the same materials are used for the construction of the two wheels. This increase can result in a measurable increase in the amount of energy needed to accelerate or decelerate each wheel. The corresponding result is an increase in acceleration times and stopping distances. In other words the car gains and loses speed slower. Like all components in any machine, moving weight from one location of a part to another location of a part where that weight has to be moved through a larger distance will result in reduced response times in regards to altering its rate which is otherwise knows as it?s speed. Any change of this manner will have a detrimental overall effect on a vehicles performance. By replacing a heavier, steel wheel with a lighter aluminum allow wheel, the aforementioned performance degradation due to increased rotational inertia can be offset. In fact, it is often the case that an overall decrease in tire-wheel mass can be achieved by plus-sizing, particularly on older, or economy cars where steel wheels are more prevalent. The Load Index is an assigned number that corresponds to the load-carrying capacity of a tire. Using the following example, tire size 205/60R15 91V, the load index 91 corresponds to a load-carrying capacity of 615 kg (1356 lbs) at maximum inflation pressure. The speed symbol of the tire is the second part of the service description. The Service Description system is used with most tires – except “Z” when no service description is given. For “Z” rated tires without a service description is given. For “Z” rated tires without a service description, consult the vehicle manufacturer for maximum speed. For proper load-carrying capacity, consult the “High-Speed Driving for Passenger Tires” section of this Guide. For European Metric tires (non P-Metric), the European Tyre and Rim Technical Organization (ETRTO) load values are defined in a load index table (see below) and valid for European Metric tire sizes. For P-Metric tires, the tire load capability is based upon a dimension specific formula that can result in different load carrying capability within the same load index. Please note that European and P-Metric sizing systems within the same size can have different load indices. 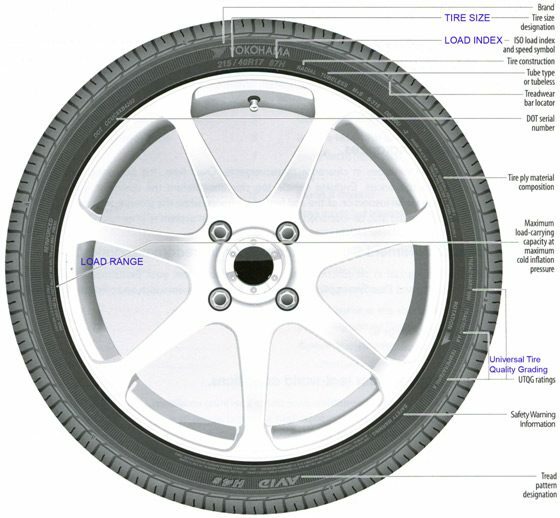 Therefore, for P-Metric tires the maximum load can be found on the tire sidewall. The code is made up of one or two letters, or one letter and one number. It indicates the maximum speed that the tire can sustain for a ten minute endurance without being a danger. Codes VR and ZR appear in place of R in the size designation. Still, a maximum speed letter may appear after the weight code placing a corresponding limit.